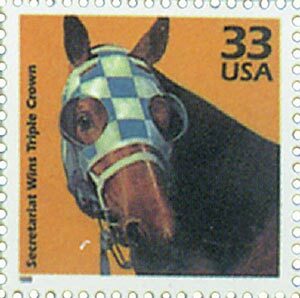 U.S. #3189g – Secretariat was featured on the 1970s Celebrate the Century sheet. On June 9, 1973, Secretariat won the Belmont Stakes race, becoming the first U.S. Triple Crown winner in 25 years. The son of the successful stallion Bold Ruler, Secretariat was born on March 30, 1970. He remained unnamed for a year, but was eventually named Secretariat by the stable’s secretary. Secretariat began training in 1972. However, he was awkward and more interested in eating than running. Over time he grew more focused and fast and managed to finish fourth in his first race in July 1972. He then won five races in a row, including the Sanford Stakes and Hopeful Stakes at Saratoga Race Course, and the Futurity Stakes at Belmont Park. During one of those races he passed eight horses in just a quarter mile and won by five lengths. At the end of his first year racing, Secretariat won the Eclipse Award for American Champion Two-Year-Old Male Horse and American Horse of the Year. 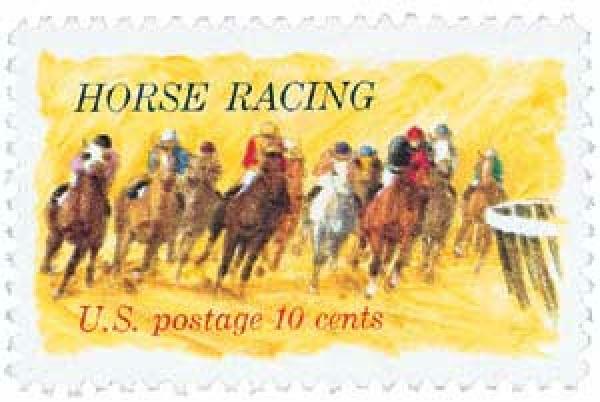 U.S. #1528 was issued for the 200th anniversary of the Kentucky Derby. 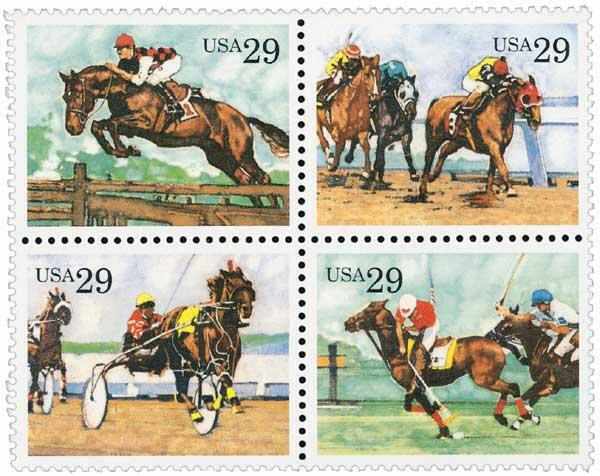 U.S. #2756-59 features different kinds of sporting horses. Two weeks later Secretariat appeared at the Preakness Stakes on May 19. Once again, he started in last place. But in the first turn he managed to go from last to first and went on to win the race by two-and-a-half lengths again. His exact time has long been disputed, as the various timers all reported differing numbers. In 2012 the Maryland Racing Commission looked at old videotapes and listened to over two hours of testimony before settling on a time of 1:53, which was the state’s record. 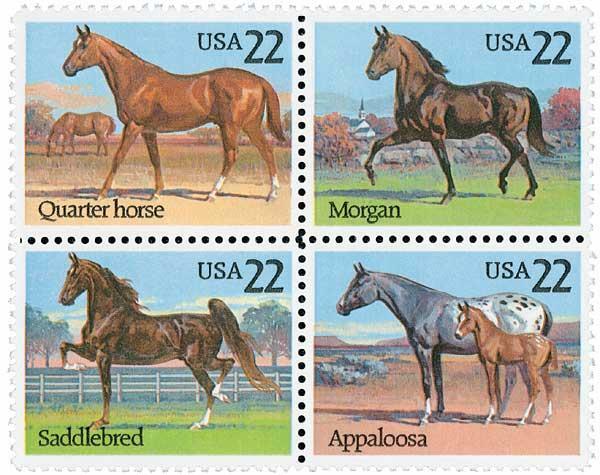 U.S. #2155-58 features different horse breeds. After these two victories, Secretariat prepared for the Belmont Stakes, the final victory needed to win the Triple Crown. In the coming weeks he was featured on the covers of three national magazines: Time, Newsweek, and Sports Illustrated. Secretariat quickly became a celebrity and household name. 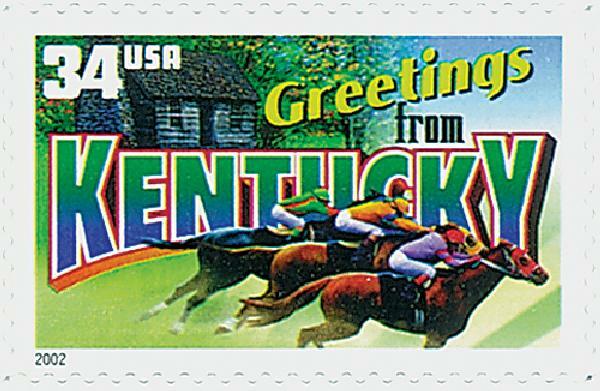 U.S. #3577 – This Greetings from Kentucky stamp pays tribute to the popularity of the Kentucky Derby. On June 9, 1973, Secretariat and four other horses competed at the 105th Belmont Stakes in front of a crowd of 67,605. Secretariat was the favorite, though he was racing Sham, who’d finished second in each of the previous races. Secretariat and Sham began the race fast – ten lengths ahead of the other horses. But along the backstretch Sham could no longer maintain their break-neck pace and, exhausted, fell to last place. The announcer excitedly proclaimed, “Secretariat is widening now! He is moving like a tremendous machine!” Secretariat continued to expand his lead on the other racers, eventually winning by 31 lengths (breaking the previous record of 25). He also ran the fastest race on dirt – one-and-a-half miles in 2:24 flat. This was two seconds faster than the previous record, and is still the record today, exactly 43 years later. Many considered this race to be one of the best by a 20th century North American racehorse. 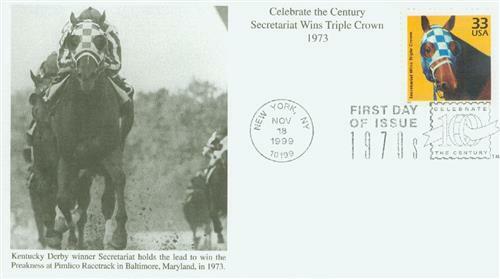 Secretariat was the ninth Triple Crown winner and the first in 25 years. He continued to race for the rest of the year, winning the Arlington Invitational, Marlboro Cup, Man o’ War Stakes, and Canadian International. In all, Secretariat won 16 of his 21 career races, and finished second three times and third once. At the end of 1973 he was again named horse of the Year and won Eclipse Awards as the American Champion Three-Year-Old Male Horse and the American Champion Male Turf Horse. Secretariat retired after 1973 and sired a number of other successful racehorses, about 600 in all. He died at age 19 on October 4, 1989. Click here to watch video of Secretariat’s Triple Crown races. 12 Responses to "This Day in History… June 9, 1973"
Secretariat gave everyone a glimpse of his future greatness in his first race. because of the real tight turns at the track. What an incredible horse he was. The video where he wins the Triple Crown is exilirating…it gives me “goose bumps” every time I watch it. Our family was fortunate to see Secretariat in his retirement years. Not only did Secretariat like to eat, his groom apologized for his appearance as this champ liked to scratch on the farm’s fencing and streak his coat with tar. An individual to the end. Arbitrailiy speaking, Secretarian demands a place in history in regards to horse racing. With a multitude of awards, titles, and records secured during his career, his legacy demands respect in horseracing heritage. Thanks for the great coverage including the videos. I’d forgotten most of this! Secretariat, as a horse, was a true GOAT, Greatest Of All Time. There was an article in Sports Illustated regarding his necropsy pointing out his heart was one third larger than a normal heart. National Museum of Racing and Hall of Fame honor was conferred upon Secretariat in 1974. In the same year, Paul Mellon commissioned a bronze statue known as SECRETARIAT IN FULL STRIDE, the life sized statue was installed in Belmont Park till 1988. In 1988, the statue was replaced by replica.Two other life sized statues are in Kentucky Horse Park . Secretariat was the only NON HUMAN to appear in Greatest Sports Performers . On May 2, 2007 Secretariat was inducted into Kentucky Athletic Hall of Fame, the first-ever animal to receive this honor. From 2010, an annual award titled SECRETARIAT VOX POPULI AWARD is presented to the best horse. Several roadways are named in his honor. His birth place The Meadows is included in the National Register of Historic Places. A Disney live action film Secretariat was released on October 8, 2010. Secretariat suffered from laminitis, a painful, incurable hoof condition. So, he was euthanized on October 4, at age 19. He was given a rare honor :his whole body was buried !in Claiborne Farm in Paris, Kentucky. Usually, only the head, heart and hooves are buried and rest of body is cremated. Secretariat`s total earnings were $ 1,316,808. Would that be his racing winnings? Surely it couldn’t include his stud earnings ! I got to see Secretariat at his home in Claiborne farm. He was big and where ever there was a camera he turned his head and poised. I don’t believe any horse will break his records. I was glad that American Pharorh won last year.